Has risk management ever been more of a “headline” issue for organizations today? Recent worldwide events have placed companies in the spotlight to provide assurance that they understand and are managing their risks effectively. These events are just the latest in a decade-long movement to enhance risk management in public companies, a trend that began in 2002 with the passage of the Sarbanes-Oxley Act. This legislation required a new level of risk management and internal control to address financial reporting risk, and remains so nine years later. Protiviti’s second Sarbanes-Oxley Compliance Survey provides valuable and important insights into how companies are complying with the internal control-related provisions of the Sarbanes-Oxley Act. 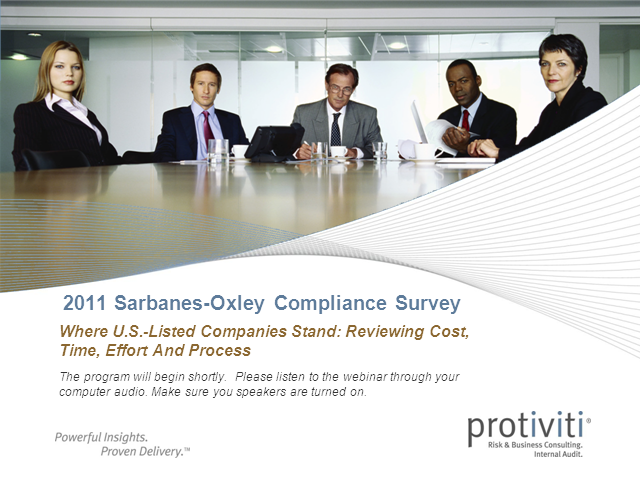 During this webinar, we’ll report on the current state of Sarbanes-Oxley compliance for all types of organizations, the related costs, associated benefits and value, as well as how to achieve a desired state of verifiable compliance and sustainability. •Most organizations report that the global financial crisis and economic events in 2009 did not have an adverse effect on their internal control over financial reporting. •After Year One, organizations consistently view the benefits of Sarbanes-Oxley compliance to outweigh the costs. •There is high satisfaction with how external audit firms are maximizing their reliance on work performed by others, particularly internal auditors. •Significant opportunities exist for organizations to automate more of their key controls.